I often get questions about the home gyms we have designed. 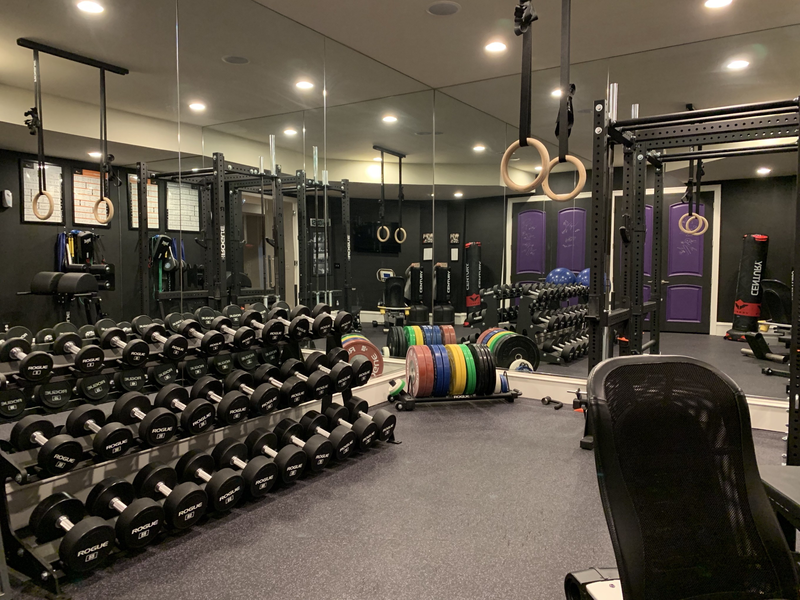 Let me shed some light and offer a bit of insight into our thought process, it may help you in designing your next home gym. Starting down the parenting track 15 years ago, and having full time jobs left us with little time to exercise. No-one can argue the benefits of exercise to maintain a healthy lifestyle, it is critical at every stage in life. For us, we decided the only way we could fit working out into our lifestyle would be to build a dedicated space in our home. A room that we use exclusively to work out and train, even if only for 15 minutes a day. In our first home HERE, our gym was fairly basic. We wanted a dedicated space for cardio vascular activity and strength training. It included an elliptical machine, a bicycle, a weight bench and free weights. We installed a few panels of mirrors on the wall and trimmed them with molding. My hubby installed the rubber floor tiles himself and painted the room a pretty shade of blue. When we sold the house, all the equipment conveyed with the sale which allowed us to design a different space in our new home. In our second home HERE we designed a gym with plenty of floor space. It was used primarily for aerobic activity, check out Building and Designing a High Intensity Interval Training (HIIT) Home Gym. At that point in our lives we were focused on cardio activity combined with strength and resistance training. We bumped out the back wall of the room to give us more space and allow for the addition of a pull up bar. When we moved to our present home, Building “The Ultimate Home Gym” the Rogue Way was born from the desire to build a real professional gym, a gym that a pro athlete would design and use. Can I say he spared no expense in designing this room? This room is larger than our prior gyms, and we tried to maximize the space with equipment we would use on a daily basis. We installed a flat panel TV, and hung gymnastic wood rings from the ceiling. Double glass doors lead into the room and the walls are covered with floor to ceiling mirrors with the remaining wall painted black. He designed a custom dumbbell rack with 15 pairs of free weights up to 75 pounds. The flooring is made from interlocking rubber tiles. In the right corner of the room is a glute ham developer (GHD) excellent for strengthening those stomach muscles. There is also a wall of accessories to include resistance straps and belts for weight lifting along with a chart of core exercises. I also have a recumbent bike which I love and use for cardio activity. I can watch TV or read while exercising. With each gym we designed, we had a different set of needs and wants. I think our present gym is the bomb and I can’t imagine needing any other type of gym to fit our work out requirements. It has all the equipment we need and provides a well rounded work out and still has floor space for aerobic activity. The products used in our gym are listed below. I hope you find this information useful and are inspired to build your own space to exercise, you won’t regret it. Building this gym is one of the best personal investments we made in ourselves – for our bodies and mind. Subscribe to Happy Haute Home to receive home and lifestyle ideas delivered right to your inbox, and follow along on Pinterest HERE, and Twitter HERE and feel free to pin and tweet your favorite pics from Happy Haute Home. Next Post Is the Dyson Hair Dryer Worth the Cost?